1. 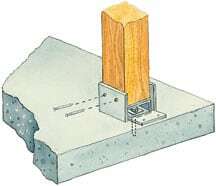 Use an anchor bolt to fasten post to base. 1Fasten each post base to the concrete with an anchor bolt (if building on the ground, dig a post hole, fill the hole with concrete, and position the top of the precast pier 3 to 4 inches above grade level). Cut the posts to length if necessary. Nail the posts to the post bases. 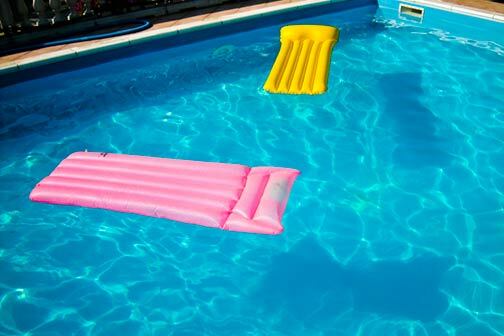 2Use a level on two adjacent sides to check that each post is vertical. 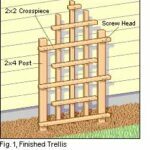 Secure each post in position with temporary braces nailed to wooden stakes driven into the ground. 3. Bolt beams onto posts. 3With a helper, position a beam on top of each post. Check that the posts are still vertical and the beam is level. Use a 7/16-inch bit to drill a 9-inch-deep hole down through the beam into each post. With a wrench, install a 10-inch lag bolt into the hole. Repeat for the other beams. 4. Fasten rafters to beams; use bracing if necessary. 4Set and space the rafters on top of the beams. With a 7/16-inch bit, drill 6-inch-deep holes through the rafters and into the beams. Install a 7-inch lag bolt into each hole. 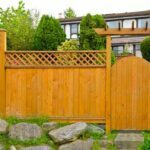 For more strength, you can install diagonal bracing between the posts and the beams. 5. Add vines or lath to provide shade. 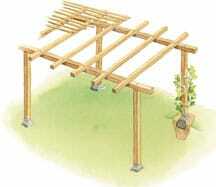 5For shade, cover the rafters with vines or lath, either 1 by 2s or 2 by 2s.